Mr. 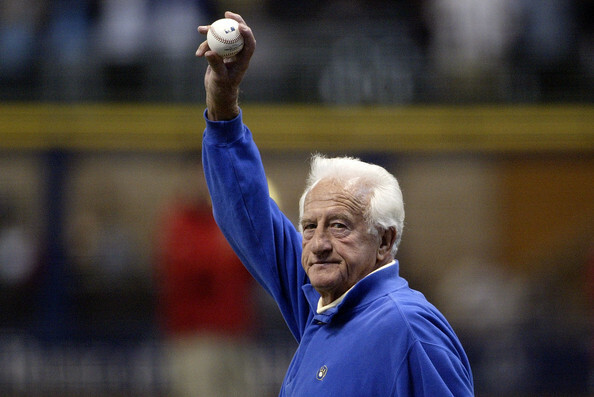 Baseball Bob Uecker is getting a well deserved statue outside of Miller Park later on this season, which raised this question by Brewers blogger Adam McCalvy: What took so long? “I didn’t have enough for the down payment,” Bob Uecker said. The Hall of Fame Brewers broadcaster, film and television star, and all around baseball legend will be revealed to Brewers fans on August 31, alongside the three other members of the Mt. Rushmore of Milwaukee Baseball: Hank Aaron, Robin Yount, and MLB Commissioner Allan H. “Bud” Selig. 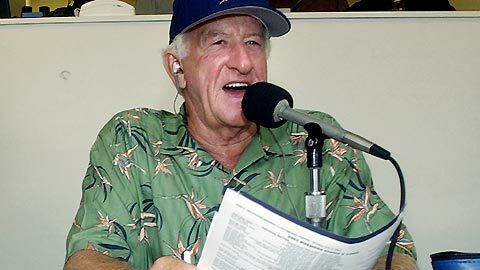 Bob Uecker grew up watching the then minor league Milwaukee Brewers, who played at Borchert Field on North 8th Street in Milwaukee. He began his playing career with the Milwaukee Braves in 1956 and made his major league debut as a catcher in 1962. Although his playing career was only for just six short years, Uecker managed to also play for the St. Louis Cardinals, Philadelphia Phillies, and the Atlanta Braves. Uecker was a career .200 hitter with fourteen home runs and seventy-four RBIs. Uecker was known for his great defense rather then his bat. Bob ended up winning a World Championship with the Cardinals in 1964. Uecker called it a career in 1967. Forty years later, the catcher turned broadcaster turned actor is a baseball legend. Uecker said his statue will portray him standing, hands in his pockets. He said he didn't want to be holding a radio microphone. "I didn't want to be holding a mic, not while I'm standing," he said. "It's like I'm just standing around the batting cage. The guy told me that people really like this pose." Selig said last year that it's humbling when you actually see your statue unveiled. Uecker understands that thought. "I thought that about Buddy's statue," said Uecker, who spoke at that ceremony. "I thought it about Robin's and Henry's. They're two of the greatest players that our game has ever had. I knew how it was for them. "When you realize something's going to be there as long as Solomon Juneau. His statue is there some place. It's been there since he found Milwaukee, and it's still up. When you look at it in that light, that it's going to be there long beyond you, beyond any of us, it's a pretty neat thing. It really is." Bob, who has had a few heart issues and operations over the past two seasons, said this about taking the measurements for the statue. He said, "I've thought about it a lot since Mark told me they were going to do this a year ago, that they wanted to do this. I actually got measured at BrewersFest two years ago. This guy is good. This is one thing I told him. I said I'm doing this one time, these measurements. Save this stuff and send it to the Schramka Funeral Home because I'm not doing this again. That's what I told him. I ain't getting remeasured."